My last physical game for this week was a game of Star Wars Destiny with Big G.
It seems like everyone is sick here in Windsor right now. No, not some big epidemic or anything, just the usual colds and flu. 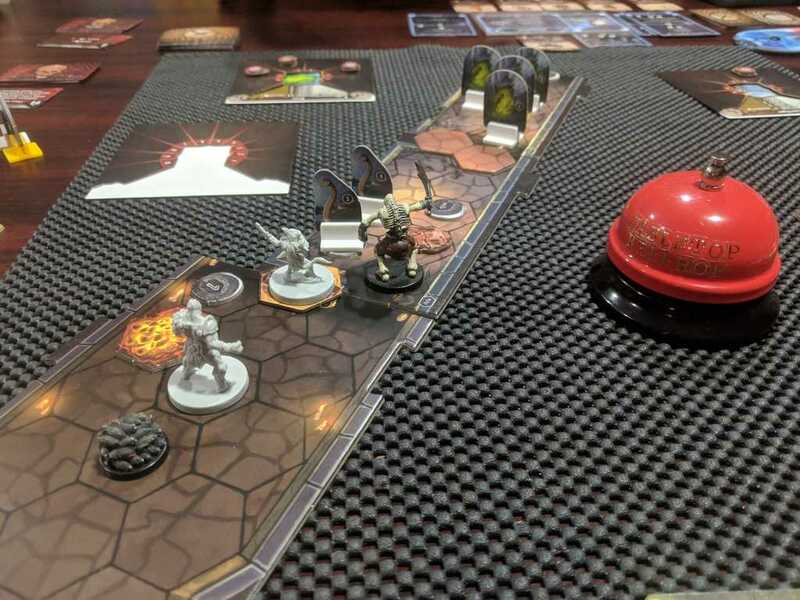 I actually should be gaming right now, but instead I’m writing this blog post due to so many people in my Monday night game group cancelling this evening. While last week it was Deanna who was unable to play Gloomhaven with us, this week it was Tori and Kat. Last week when this happened I looked at all of our options and decided that we would try out a three player random dungeon. You can read all about that thought process and check out how it went in last week’s Tabletop Gaming Weekly. The end result was that we had all decided that a Random Dungeon was the way to go if we were short players. So that’s what we did Friday. It was just Deanna and I and we played through and beat a three room random dungeon. 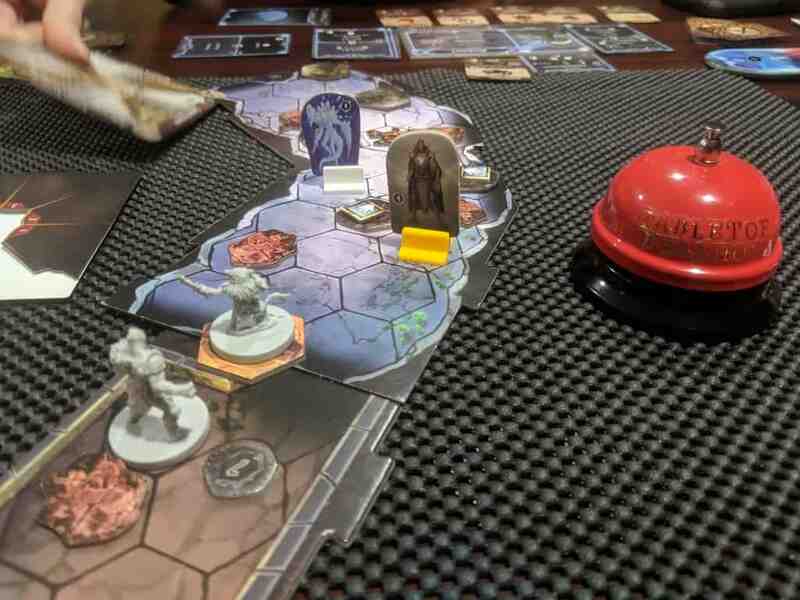 This was our first time playing two players, my second time trying the random dungeon thing and Deanna’s first. It seemed to go really well. I’m sure it helped that I actually remembered to place the right number of monsters for two players. I also have to thank those that joined us in the chat room on Twitch for reminding me so that I didn’t mess it up again. Again, I enjoyed the Random Dungeon rules. They seem to work really well. I liked that we actually drew the same room as our game but it played totally different as we drew a different set of monsters this time. This time around the hazards you face for opening each room after the first seemed particularly brutal and I’m really starting to hate oozes. Our dungeon consisted of the Foggy Alcove, then an Infected Burrow and finally the Frigid Tunnel. A video version of this stream will go live this coming Thursday on our YouTube Channel. 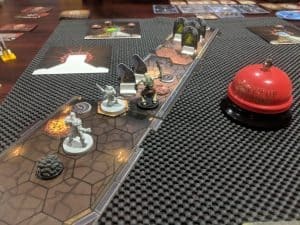 I also welcome you to join us live Friday night at 8:30pm Eastern on Twtich where we stream our Gloomhaven games every week. 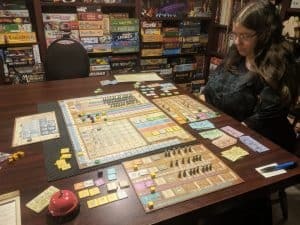 I first learned about Arkwright through the Heavy Cardboard Podcast. It was one of the games featured early in the show (episode 15) and one of the first to be nominated for and win their Golden Elephant award. I’ve had the game for more than a year, read the rules multiple times but have never actually gotten it to the tablet until this past week where I got to play it twice. The main thing that kept Arkwright from hitting my table is that it’s a heavy game. It’s rated a 4.54/5 on BGG putting it above every other game in my collection. For example Food Chain Magnate only sits at 4.19 and Indonesia at 4. This isn’t the kind of game you just show up to the FLGS with and grab a couple of local people and sit down and play. It’s the kind of game that’s not going to be for everyone and that needs the right group. Thankfully we had a new gamer join the Windsor Gaming Resource on Facebook who was specifically looking to play more heavy games. This led to a group chat and four of us meeting up at The CG Realm this past Saturday to play something heavier. 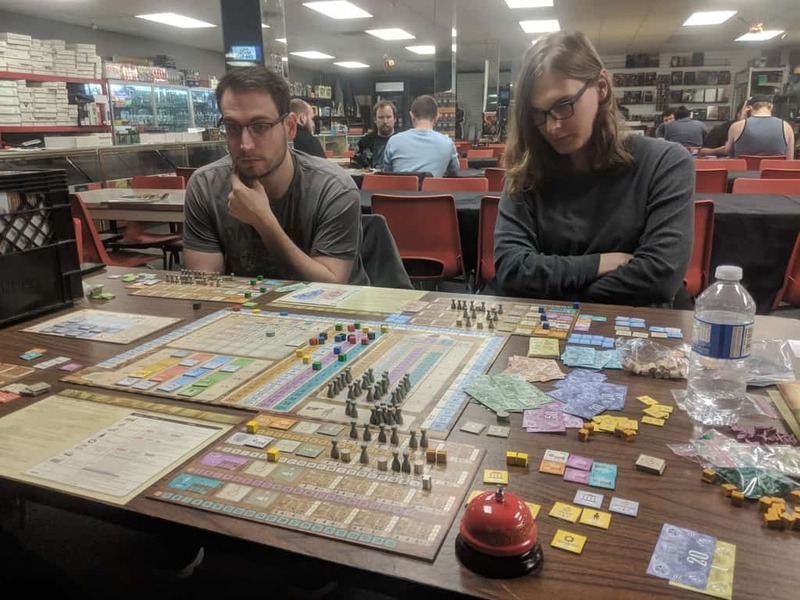 Combine this with my recent play of Shafuasa, which had me itching to play a really good economic game, and we ended up with a four player game of Arkwright. Now before that Saturday game day at the FLGS, Deanna and I sat down on and played a two player game with the goal of figuring out the rules so that I could better teach it on Saturday. I’m very glad we did. That two player game really helped me get my head around all of the interactions in the game. 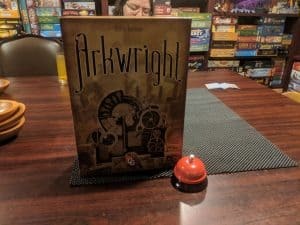 Arkwright is an engine building game set at the turn of the century and the dawn of automation. Players are investors who are managing two to four start up companies in England, with the goal being to have the most valuable block of stocks in their own companies. This is a heavy economic game where players are opening/closing factories, hiring workers, managing demand, developing their quality, automating manufacturing, paying wages, developing distribution networks and more. The game includes two ways to play. The simpler Spinning Jenny version of the game and the full Water Frame version. So far I have only tried the Spinning Jenny version. The main difference is game length and the fact that Water Frame adds exporting and shipping to the game. At this point, I’ve only played two games. After a couple of more plays and after I try the full Waterframe rules, I will probably do up a more detailed review. For now I will just says that Arkwright delivers exactly what I was expecting and wanting from it. This is an excellent, brain burning action selection game that had all four of us breaking out our phones to use as calculators. Saturday’s game even had one player grabbing some note paper and a pen to plan out their final round. Both games were tense and final scores were close. Very close. 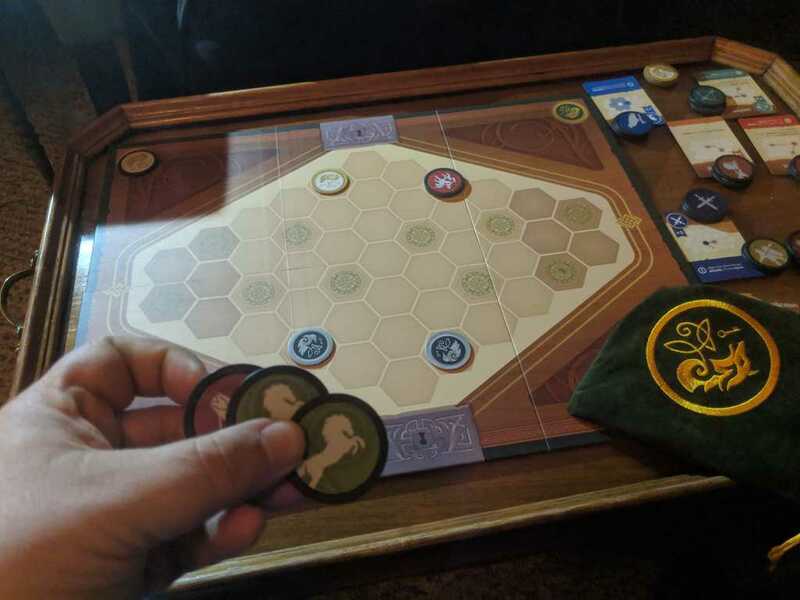 Gameplay with two players was very quick, under 2 hours with teaching but once we jumped up to four players it went significantly longer, taking over 3.5 hours for our first game. From what I’ve heard and read the Waterframe version can last up to 6 hours. Everyone I’ve played it with so far has really enjoyed it. It’s tight, punishing and exactly what I want from a game like this. Last night Deanna and I had a fantastic dinner at Jack’s Gastropub and then spent the night upstairs at INN31. Of course we also brought some games to play. During the meal I broke out one of my favourite two player games for date night: Onitama. I’ve got the digital version of Onitama on Android, on my phone and that’s what we used to play. While it’s an excellent implementation of the full board game, I much prefer the physical version. The app does everything right. It looks awesome, it’s easy to use and, it perfectly emulates the physical game, but it’s just not the same. I think it’s the spatial nature of Onitama that I find works better for me with actual physical pieces. I have a way better time visualizing the moving of physical pieces than I do with the digital ones. After we ate and were back up in our room that’s when I broke out War Chest. Now Deanna had given me this for my birthday and we have both been excited to try it. I have to blame The Secret Cabal (ep 167) for me wanting this one. Their review of the game which made a lot of comparisons to another two player game I love, The Duke , had me sold before having seen the game. Then seeing just how nice it looked, I wanted it even more. Deanna and I played through three games. All three using the starting suggested two player set up and the same armies each time. We enjoyed all three plays greatly. At this point though it feels like we’ve only scratched the surface of the game. There is a lot more there for us to explore so I’m going to save my thoughts for after we get a few more games under our belt. I will say that we both enjoyed it enough that you can expect those few more games will come quickly, probably this coming week. 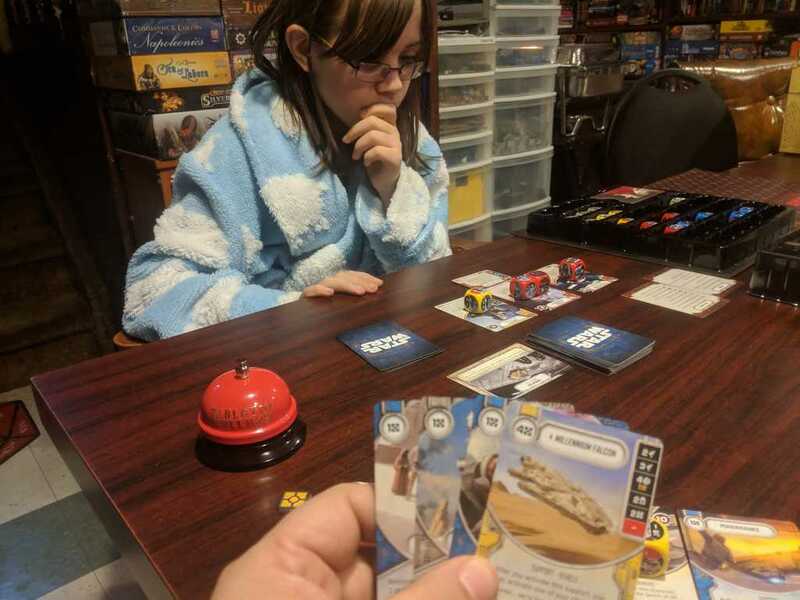 It’s been months since my daughter has asked to play Star Wars Destiny, so when she came to me Saturday asking me to play a game with her before heading to the FLGS there was no way I was going to say no. Way back in July when we last played, Big G and I finished off our game day by building our own decks. Up until that point we had just been playing with the preconstructed decks in the Star Wars Destiny Two Player Game and the starter sets featuring Luke Skywalker and Boba Fett . Now, months later, we finally got to check out the decks we had made. It went well. We both immediately noticed how much more fun the game was with three characters and more dice right from the start. It felt like we had way more options. It was also cool seeing how the decks we built worked out. 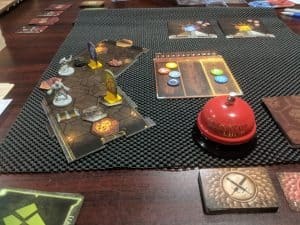 Both of us noticed a couple of things we could have done better and after our game made a few quick tweaks to our deck We both had fun playing and I still really enjoy this collectible dice and card game. I just hope it’t not another nine months before we play again. So that was what I got played this past week. What games do you have for #WhatDidYouPlayMondays?